You probably know where this road has taken us. We soon had a couple hundred different hostas and joined the American Hosta Society (aka:AHS). 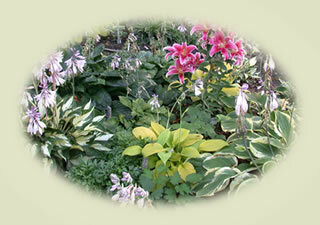 As a matter of fact, many of our daylily friends also had gotten into growing hosta; they encouraged us to join also. We currently grow about 800 varieties of hosta in our gardens. We are very fortunate that we have lots of land, so aren't restricted by the size of a city lot <vbg>, just by the amount of work which we can do to maintain them all. We both have full time outside jobs, so that is a serious consideration. Many of our hosta live in a large shady area that Harold prepared under 3 great big old maple trees in our back yard. Yes, we know that maple trees with their shallow roots are not the ideal companion planting for hosta, but hasn't turned out too badly. We just plant the smaller shade loving companion plants nearer to the trees and the hosta a little further out. We also water more frequently than would otherwise be typical. I can enjoy the view of early spring bulbs and then lovely hosta from the kitchen window. It is a very restful view. Although we hope to be able to offer many varieties of hosta for sale in the upcoming years, currently we only have a limited number available. If you see some that you are interested in, please drop us a line and I will see if we have those varieties available. So, please do enjoy browsing through the hosta list and the photo gallery, but keep in mind that many may either be new to us or not yet lined out for increase and sale. Many of the photos are not showing off the plants to their best potential, as the photos were either taken at the time we purchased them, or as very young divisions. We do hope to do some significant updating of the photos this upcoming summer which will show them as more mature specimens. 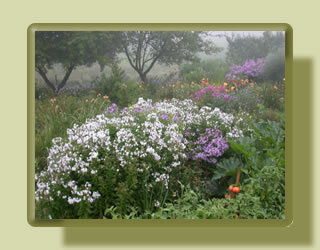 We have met many wonderful gardeners by attending meetings and conferences. If you haven't considered joining in the past, do take a look at the national web site www.hosta.org and see if it isn't something that you too might enjoy.